For pharmacy students, one of the most frequently asked questions about their course of study is this – how on Earth can we remember individual side effects and drug interactions of each medicine? To memorize drug side effects, though, you don’t need to remember “individual” side effects and drug interactions. There are some great ways you, as a student, can implement to help you wade through the sea of information before you. Whether you’re preparing for the NAPLEX exam, a pharmacology exam or any other medicinal-related exam – the strategies below go some considerable way toward helping you maximize your results. Ignore anyone who suggests that the best student has the best memory, or that only gifted students can commit these pharmacology facts to memory. Often, it’s the worst student with the best strategy comes out on top. By adopting the strategies below, you, too, can come out on top. Rifampicin Red-orange sweat, tears, urine etc. Of course, this is just the beginning. Each of the above medicines is associated with innumerable more side effects. The point, however, is this – to begin by focussing on groups of medicines and their well-known associated side effect. Often, the side effect will be somewhat unique – such as isoniazid and pyridoxine deficiency. Not many medicines are associated with this type of deficiency, after all. If you are new to studying pharmacology, pharmacy, nursing or medicine – the above table is the ideal place to start. These are the most fundamental side effects that you need to memorize. 2. Why do side effects happen? To memorize drug side effects effectively, you need to understand why those side effects happen. In other words, what’s the mechanism that underpins that effect? Let’s examine ACE inhibitors. ACE inhibitors, such as Ramipril, are known to cause hyperkalemia (elevated potassium levels). Rather than remembering this factoid for what it is, try to understand why this side effect exists and not some other side effect. In the case of ACE inhibitors, they work to suppress aldosterone levels by blocking angiotensin II. Once you understand what ACE inhibitors block – in this case, aldosterone – and once you understand what effects aldosterone has (elimination of potassium, for example), it suddenly doesn’t come as any great surprise why ACE inhibitors are linked to hyperkalemia. While understanding drug mechanisms is not essential to remembering side effects, it does make things that much easier. This links back to the previous two strategies; the need to remember in bulk. Often, drug effects are not limited to any one single drug. Instead, they’re common to an entire family of drugs. In the case of ACE inhibitors, a persistent, dry cough is a thread that weaves its way through the entire drug class. There is no need to go through each ACE inhibitor, one by one, to discover whether each drug is linked to that side effect. Earlier members of a drug class are, though, often associated with different side effects – usually worse. Captopril was one of the earliest ACE inhibitors and was linked to multiple daily dosing and a metallic taste. These two problems were rectified with later ACE inhibitors. First-generation H1 antagonists are associated with greater levels of sedation compared to their second-generation counterparts. Again, this trend is familial. There are few reasons to go through each drug one by one. Of course, we cannot adopt this strategy wholesale across all medicines. There are exceptions to the rule. The point here, though, is to help you memorize drug side effects en masse. You can focus on the exceptions of exceptions of exceptions later. Get the foundations right and you can build your side effect knowledge with ease. Pharmacology flashcards are an enormously powerful tool that distil the essential facts that you, as a student of pharmacy, medicine, or nursing – need to know. You can prepare flashcards very easily. On one side list the drug or drug class; on the other, list the side effects and/or mechanism associated with that side effect. Start with the basic, most fundamental side effects (see table above) and build out. In a matter of days, let alone weeks, your knowledge of drug side effects will immeasurably improve. Alternatively, you can review the pharmacology flashcards and mnemonics of our member’s area. We’ve compiled the essential drug side effects you need to know. 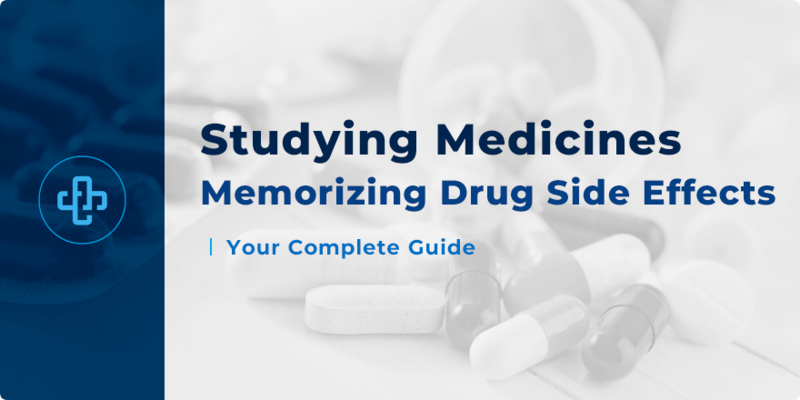 If you’re struggling to memorize drug side effects, help is available. The strategies above, once properly implemented, can enormously improve your pharmacology study. Preparing for that NAPLEX exam, pharmacology exam or other clinical exam has never been easier. Be sure to check back to our pharmacy blog in the near future for more great study tips.